OS grid reference SE 3475 5698. 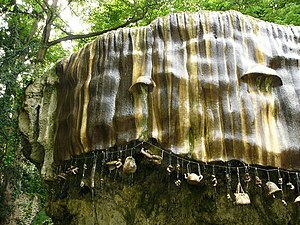 The famous petrifying well that turns anything to stone, eventually, is located within the Historic Theme Park known as ‘Mother Shipton’s Cave’, a visitor attraction just off the Harrogate road (A59) and on Long Walk, which runs alongside the gorge of the river Nidd, just half a mile south of the town centre. At the side of the well is the equally famous Mother Shipton’s Cave, where the Yorkshire prophetess, fortune-teller and mystic lived for much of her life during the 16th century. The spa town of Harrogate is a few miles to the west. The dropping well was undoubtedly known to our prehistoric ancestors, to the Romans, the Anglo-Saxons and also our medieval forefathers. It was first recorded in 1538 and from that time onwards it has been visited for its rich mineral content and healing properties. But the place is geologically quite unusual in that the water that flows over the smooth limestone cliff and into a large rocky pool below is highly calcified, coming up from a deep pool or lake in the limestone above, so much so, that it leaves calcified deposits on anything that is placed beneath – indeed many curious objects have been left here over the centuries by thankful pilgrims; some quite notable visitors have left toys, hats, boots, stuffed birds and kitchen items belonging to them, but just about anything and everything is suspended below the overhanging cliff to collect the constant, fast-flowing drops of lime-rich water which eventually turns these items into stone – the very same thing that causes stalactites and stalagmites in deep underground cave systems. The well was visited in 1534 by English antiquarian John Leland (1506-52) who gave a very resonable description of it for the time and was apparently very taken with the well. 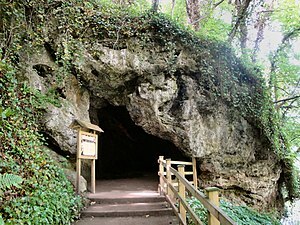 Close by the well, in the side of the hill, is Mother Shipton’s cave. Ursula Southill or Southell was born near the cave in 1486 or 1488? and died there in 1561. She lived in the cave as a sort of recluse and came to be known in later years as Mother Shipton the Yorkshire prophetess, fortune-teller, mystic and, to some a witch! This was probably because she always wore a pointed hat and had ugly, facial features, such as a crooked nose and a protruding chin. But Mother Shipton was not a witch in that sense. Many local people, including the nobility and an abbot, came to seek her advice on medical problems and other issues that they were unable to resolve themselves. And Mother Shipton became famous for her prophecies with regard to many future events including: the plague, the civil war, the great fire of London, wheeled transportation, iron roadways (railways) and stone constructions carrying water (viaducts). All these prophecies were to be published in pamphlet form for the first time in 1641 and reprinted in 1645 by William Lilly the prominent astrologist, and even Samuel Pepys mentions her in his diary wrote during the great fire of London in 1666, and in 1667 yet another pamphlet mentioned the Yorkshire prophetess, although these works were quite often embellished. Two of Mother Shipton’s prophetic verses fortell of the end of the world at some point in the future! And she foretold of royal marriages and deaths ie Henry VIII and Ann Boleyn, and of Mary, Queen of Scots, tragic execution. Robinson-Walsh, Dawn (Edited), Stories & Tales Of Old Yorkshire, Printwise Publications, Tottington, Bury, 1993. Woodhouse, Robert., North Yorkshire – Strange but True, Sutton Publishing Ltd., Stroud, Gloucestershire, 2003. Categories: Caves / Rock Shelters, The Dropping Well at Knaresborough in North Yorkshire | Tags: The Dropping Well at Knaresborough in North Yorkshire | Permalink.